"After a trip to the farmer's market, I created this salsa! It's a more sweet, less savory salsa and it pairs nicely with sugar cinnamon chips." 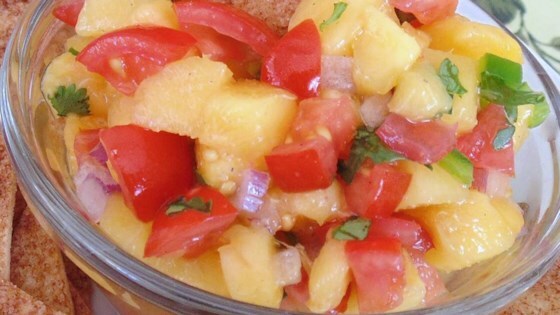 Mix peaches, tomatoes, onion, cilantro, and jalapeno pepper together in a bowl; sprinkle with cardamom. Drizzle lime juice and lemon juice over salsa; toss to coat. Brush tortilla wedges with melted butter; sprinkle generously with cinnamon sugar. Arrange coated wedges on a baking sheet. Yummy! I sprayed the tortillas like someone else suggested. Also, used the street taco size tortillas and make little pizzas out of them! A nice lunch! Tasty, too!